Don Mitchell of Cambridge rode his bicycle to the gym before going to work last week. Mitchell is a software engineer and has no plans to retire but has begun pondering when to begin collecting Social Security benefits. Don Mitchell loves his job as a software engineer, has no plans to retire, and doesn’t turn 60 till next March. But he’s already begun pondering a weighty question facing most Americans in their early 60s: when to begin collecting Social Security benefits. That question might seem straightforward if you haven’t started looking into it. But there are enough wrinkles and curveballs to warrant careful consideration. The age when Uncle Sam will begin paying you full benefits — the “full retirement age” — used to be 65, but now it’s 66 or 67, depending on when you were born. You can collect reduced monthly benefits as early as 62. Or you can wait until as late as 70 and receive more, but you’ll need money from another source to tide you over. 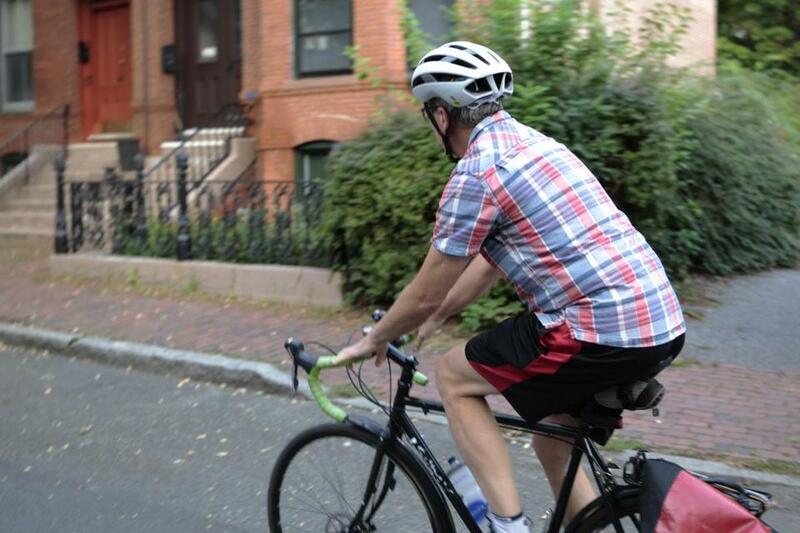 For people like Mitchell, who bikes to his job crunching data for website CarGurus in Cambridge, the decision entails a variety of considerations: health, savings, when the time is best to stop working, plans for the retirement years. “If I’m healthy and active, I want to travel,” Mitchell said. Circumstances are different for everyone, and when to turn on the Social Security spigot is a very personal decision. Married people have to consider their spouses’ needs and plans. For those planning to tap into their retirement accounts so they can delay collecting, tax considerations come into play. And a big part of the calculation is pure guesswork. Financial planners and consultants say that, for many people, choosing to collect early or wait until later boils down to betting on how long they’ll live. Czarnowski recommends that future retirees check out the government’s free benefits estimator. Once it verifies your identity, it can quickly generate data on how much you’ll receive, depending on when you’re planning to retire. Social Security represents the largest chunk of retirement income for most Americans. The benefit is calculated through a formula averaging three and a half decades of inflation-adjusted taxable income. If you’ve worked more than 35 years, it averages your highest 35 years; if you’ve worked less than 35 years, your benefits will be lowered by averaging in zero for each year you didn’t work. The majority of those now collecting started doing so before their full retirement age. But your permanent payout will be roughly 6 percent lower for each year that you start claiming benefits before you hit your full retirement age, Czarnowski said. If your full retirement age is 66 and you start collecting at 62, for instance, you’ll only get 75 percent of your full benefit each month. Conversely, he said, there’s a financial incentive to hold off. If your full retirement age is 66 and you wait till 70, you’ll collect 32 percent more in monthly benefits, about 8 percent more for each year you wait. But you’ll need to generate income to live on until you start collecting. That often means drawing from a 401(k) or some other retirement account before age 70, when the government begins requiring mandatory annual withdrawals. (Remember: Money taken out of a retirement plan that was funded with pretax income contributions will trigger taxes.) But it could also involve tapping cash savings, rental income, or continuing to work full- or part-time. “Generally speaking, the best strategy — as long as income and expenses permit it — is to wait for as long as possible,” said Jill Fopiano, president of O’Brien Wealth Partners in Boston. The wait can be financially challenging for those who fear depleting their savings, and impractical for those who want to retire early and haven’t saved enough. But retirement planners say there’s a “break-even point” — typically between ages 80 and 82, depending on benefits and full retirement age — where the cumulative Social Security payout for those who waited till 70 exceeds what it would have been if they’d begun collecting at full retirement age. But that may not be feasible for many Americans, said Mark Henry, a financial planner in Charlotte, N.C. He said of many of his clients, after spending decades paying into the system, are eager to begin recouping. David Smith, chief investment officer at community bank Rockland Trust, said the stakes are high for baby boomers. Many will have to depend largely on their own savings in their later years, as employers have scrapped or reduced pensions. The “decision tree” around Social Security — with multiple claiming strategies — can be overwhelming, he said. Adding to the pressure are looming questions about the financial health of the Social Security program. The trust fund that provides for benefit payments is underfunded and on track to run out of money in about 18 years. So lawmakers will have to find a way to shore up the system’s financing or cut benefits. “Many people ask, ‘Is it going to be there for me?’ ” Smith said. 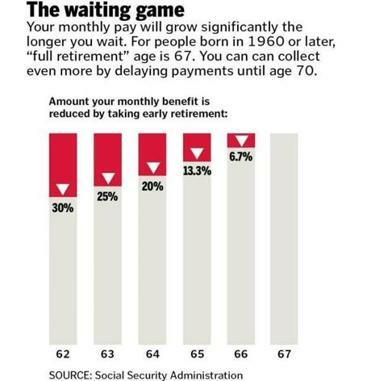 In the meantime, people approaching Social Security age are planning as best they can. He also considers the health of the economy. “I know we’re likely to have one or more recessions before I die, which can do a number on your retirement savings,” he said. Married couples have to consider each other’s benefit. For spouses who both worked throughout their lives, a common strategy is for one to collect early or at full retirement age while the other waits till beyond full retirement age. In cases where one spouse expects a much larger benefit, couples may want to take advantage of a recent rule change. The new provision lets a spouse claim half of the other spouses’ benefit in lieu of their own — but only if the higher-paid spouse has begun collecting. No two people will look at the calculus in quite the same way. Georgia Hiller, a lawyer in Naples, Fla., was able to draw Social Security survivors benefits for a time when her husband Tony died of sudden cardiac arrest years ago and she had to stop working to care for their two children. The survivors benefit ended for her when she returned to work, but her son and daughter were able to continue collecting until they turned 18. The experience has colored how Hiller, now in her mid-50s, views the question of how soon she might begin taking Social Security retirement benefits. She looks at the program as “a safety net that you’ve paid into,” not “a game of numbers” on a spreadsheet.